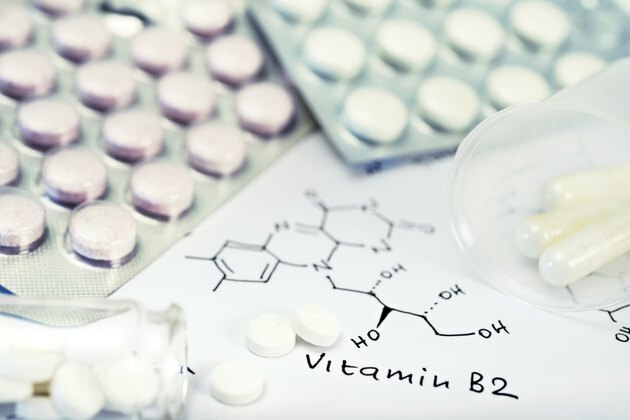 Vitamin B-complex supplements include all the B vitamins including riboflavin, also called vitamin B-2. Riboflavin causes urine to turn bright yellow when you ingest it in excess. Your body requires riboflavin to break down carbohydrates, proteins and fats and release energy from those nutrients in all of your body's cells. It assists with growth and production of red blood cells. Riboflavin also enables your body to use oxygen. Most people in the U.S. meet or exceed riboflavin recommendations, which vary from 0.3 mg per day to 1.1 mg per day, depending on age and gender, according to MedlinePlus. Riboflavin occurs in milk and dairy products, whole grains and dark green leafy vegetables, such as broccoli, turnip greens, asparagus and spinach. Eggs, lean meats, nuts and legumes also provide riboflavin. Breads and cereals may also be fortified with added riboflavin. Although milk and liver are the richest sources of riboflavin, nutritional yeast, dark green vegetables and whole or enriched grains provide an ample source for vegans who do not consume dairy products or meat. Food processing may destroy some vitamins, but little riboflavin is lost during ordinary cooking because riboflavin is stable to heat. Ultraviolet light and irradiation destroy riboflavin, so milk is sold in cardboard or other opaque containers. Precautions must be taken when adding vitamin D to milk by irradiation, according to Eleanor Whitney, Ph.D., and Sharon Rolfes, M.S., R.D., authors of "Understanding Nutrition." The vitamin B complex includes thiamin, riboflavin, niacin, biotin, pantothenic acid, vitamin B-6, folic acid and vitamin B-12. Vitamin and mineral supplements may be appropriate in some circumstances, such as to correct overt deficiencies and reduce the risk of certain diseases. At high or therapeutic doses, a supplement acts as a drug; use it only with the recommendation of your physician or registered dietitian. More than half of the U.S. population takes vitamin and mineral supplements regularly, and 1 in 5 people take a multinutrient supplement daily, as reported by Whitney and Rolfes. B vitamins are water-soluble and move directly into the blood, where they travel freely throughout the body. Your kidneys detect excess riboflavin, which is excreted in the urine. This excess riboflavin, especially when you consume it in large doses, causes the urine to take on a characteristic bright yellow color. This expected result is no cause for alarm, according to MayoClinic.com. Consult your health care professional if you notice other unusual effects. Lack of riboflavin causes inflammation of membranes of the mouth, eyes, skin and gastrointestinal tract. Itching and burning eyes, sensitivity to light, reddening of your corneas, sore tongue, and itching or peeling skin and cracks in the corners of your mouth may occur. Your doctor or registered dietitian may recommend riboflavin.